Search algorithms are so complex that it is impossible to focus on just one or two elements when developing an SEO strategy. To place across all the major search terms for a business’ niche, they must study the competition and be prepared to modify their campaign. I walked readers through this in my article, The DIY SEO Audit: Next Steps for Beating Out the Local Competition Online. There are various broader factors that will be required each time the business tries to rank a page in SERPs (search engine results pages). One of the most important of these factors is trust. If Google and the other search engines don’t trust a particular page, it will be virtually impossible to place in the top of search results for the desired keywords. Today, I want to talk with you about trust – not just among consumers, but search engines, too. So, what are some of the main factors involved in gaining the trust of search engines? Keep reading to find out. Yeah, yeah… You’ve heard it before, but are you really listening? According to Google, content needs to demonstrate expertise, authoritativeness and trustworthiness (E-A-T). Sites still using filler posts to target keywords are getting less and less search traffic. As search engines continually get smarter, their algorithm updates also do. They filter out content that is not useful to searchers. Search engines use factors like time spent on a site, click-through rate (and most likely bounce rate even though they deny it), plus manual reviews to recognize when site visitors do not regard content as helpful. It seems the only published measure for a piece of quality content from search engines is Google’s Search Engine Evaluator Guidelines. If you are not sure where to start when it comes to content, attempting to better the output than those in the top ranking sites is a great place. Brand new sites struggle to place high since search engines are not ready to trust them yet. New domains need to get indexed. The content itself can take some time before gaining a top placement. After the site has aged and gained trust, new posts can quickly earn a top search position with the right promotion. Building trust factors through garnering links via social media, directories and other authoritative sources can improve trust and speed up the process. Don’t skip the steps of setting up Google Analytics, Google Search Console and submitting the site map. Authority is a factor that encompasses several different elements. I mentioned a few above – expertise and trustworthiness. In fact, you can’t build authority without them. SEO tools like Majestic, Moz and Ahrefs offer individual authority metrics that give an indication of the way the search engines view a site. Typically, these parameters will include page and domain authority, backlink profile, social media shares, and internal linking. All of those are so important that a business must complete an SEO audit to study them periodically. Relevance is becoming increasingly important, as Google and the other search engines can detect the topical content of a site and a page. If the site is in the fitness niche, for example, gaining most of the backlinks from business-focused sites could cause issues. Every site has backlinks from broader sites like Facebook and Twitter, but the backlink profile is expected to contain a good proportion of relevant sites and pages with appropriate surrounding content. A new backlink won’t have the same level of power as an aged one. Therefore, ensuring the business continually builds backlinks will allow the continual building of trust. Backlinks get ignored or removed, particularly if they are low quality, so avoid quick and easy links that don’t last. As the quality backlink ages, the authority of the linking page improves. Don’t be afraid to disavow a backlink that is of low quality. The backlink profile needs to built up based on quality, not quantity. Sites and servers can be hacked, putting visitor security at risk of being compromised. If the site gains a reputation as a security threat, the site could suffer a penalty, impacting search engine placement. Google is known for blacklisting domain names until they resolve security issues. Website security tools like WordFence provide security alerts for webmasters. There are also more advanced paid tools on the market. The most important thing is to protect the site and stay informed on issues that could be a concern. Search engines are so driven to keep consumers secure that they alert them when visiting a site that isn’t HTTPS. Chrome currently displays a subtle warning. Coming soon, that warning is going to be even more apparent, potentially with searchers having to click an authorization to continue to the website. Anti-virus software includes browser extensions to warn site visitors when they attempt to visit a website they don’t trust. In addition, they already require special authorization to continue through to the site. Make security a priority to continue to compete! While search engines say that bounce rate isn’t a ranking factor, a high bounce rate can indicate a lack of trust. If a large percentage of searchers click on a result and immediately click back to the search results, it is fair to say they did not find what they were looking for. It could be other factors, like the site was slow to load or not mobile-friendly. Whatever the reason, a click back indicates the site was not relevant to the search. The reasons will vary for each searcher, but a lack of trust will be among them. Monitoring bounce rate through Google Analytics enables the business to adjust a page if the bounce rate is high and the click-through is low. Put this feature to use. All of the elements mentioned above are achievable, with time being the biggest factor – time for search engines to trust the site; time for the business to work on their site; time to get some help! If time is an issue for you or the businesses you represent, we have the team and we will make the time. Request a demo to learn more today. 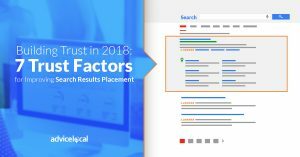 The post Building Trust in 2018: 7 Trust Factors for Improving Search Results Placement appeared first on Advice Local.